Can’t you just imagine having an elegant little tea party in this sweet pool-side getaway? I’ve been meaning to share these photos with you for awhile, and what better time than now? 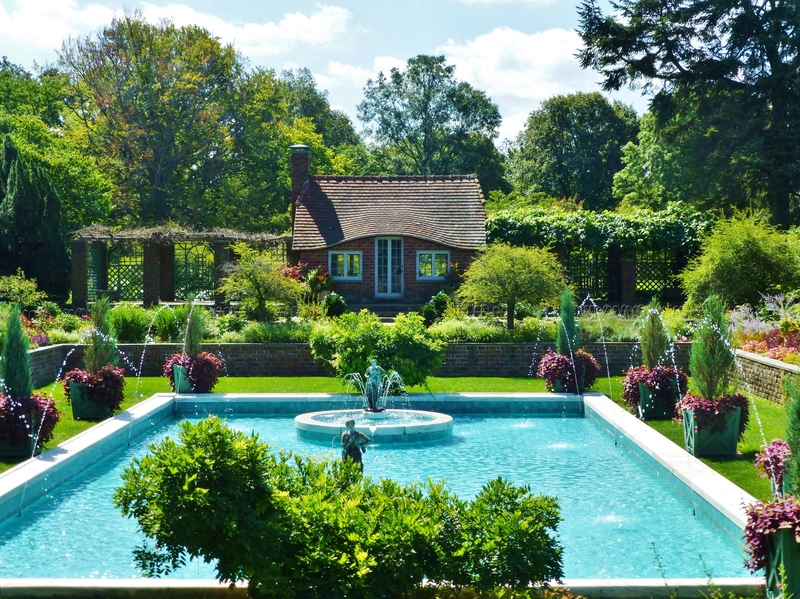 My family and I visited this amazing garden in Oyster Bay, NY. It’s called The Planting Fields Arboretum. The 400 acre state park has so many beautiful spaces and includes the amazing Coe Mansion too. 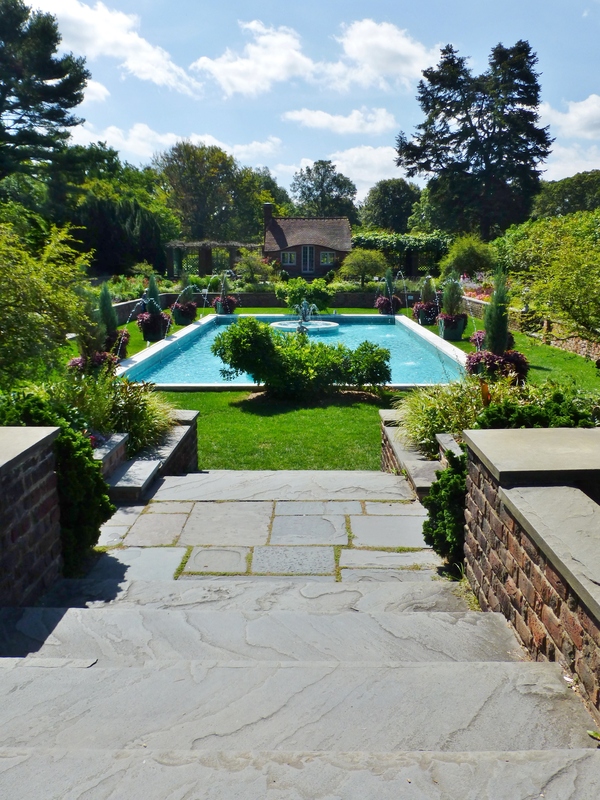 Today, I’d like to share the absolutely amazing pool garden–it’s just one of the many fabulous elements in this spectacular New York State Park. 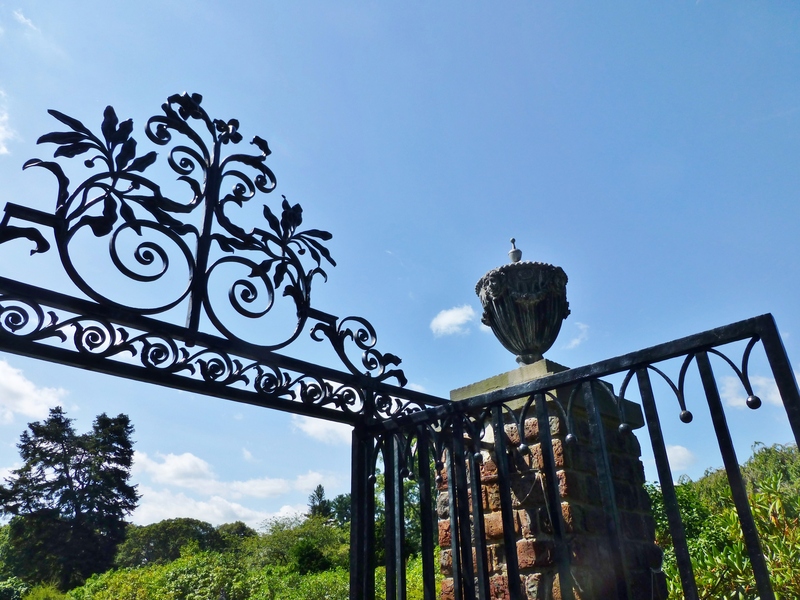 The absolutely stunning gates leading to the pool garden at Planting Fields. The brick columns, topped with decorative urns, provide a stately feel to the pool area. Here’s a detail of the ornate gates at the pool entrance. I adore the leaf and floral design of the pediment. And those urns…absolutely gorgeous with their floral swags and Grecian faces! 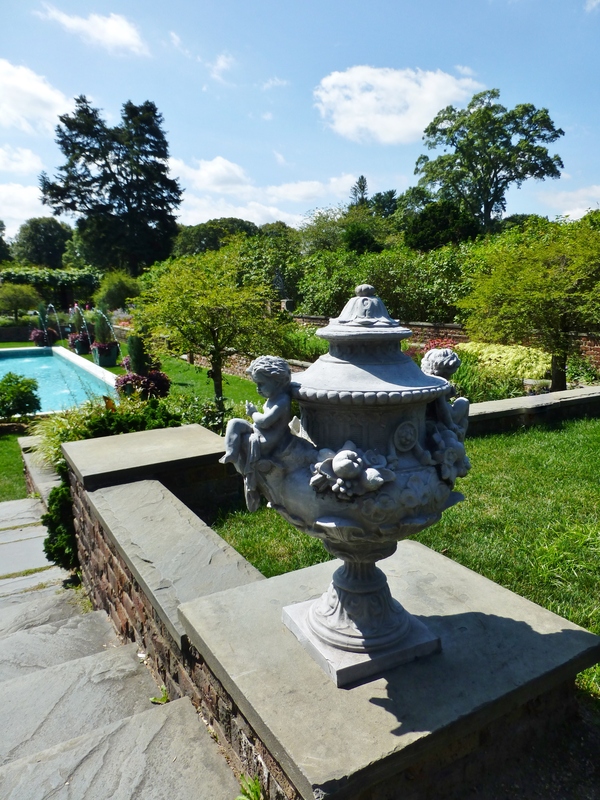 Another pair of beautiful urns adorn the stairway, leading down to the pool. Luscious garden plantings surround this exquisite space. 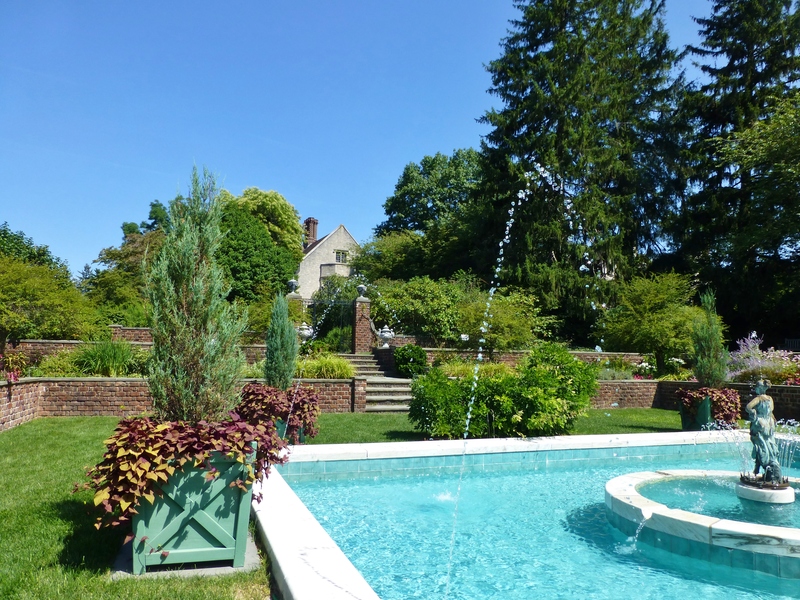 The absolutely spectacular pool at Planting Fields Arboretum. Plantings in this garden are laid out very symmetrically, and the overall space has a very English feel to it. Obviously we visited the Park on an equally spectacular summer day! On closer inspection you will notice the adorable English Cottage, pool house at the far end of the pool. You can also see the amazing statuary placed amidst the pool fountains. Large square painted wood planters frame out the pool with evergreens and trailing vines, which echo the color of the adorable red brick cottage. Looking back in the opposite direction, you can see the imposing Coe Mansion peeking out from between the mature trees outside the pool fence. The plantings in the wooden planters are shown in more detail here too…I love the simple, but lush planting of evergreens with modest purple sweet potato vines. A closeup of the charming English cottage with it’s eyebrow roofline. 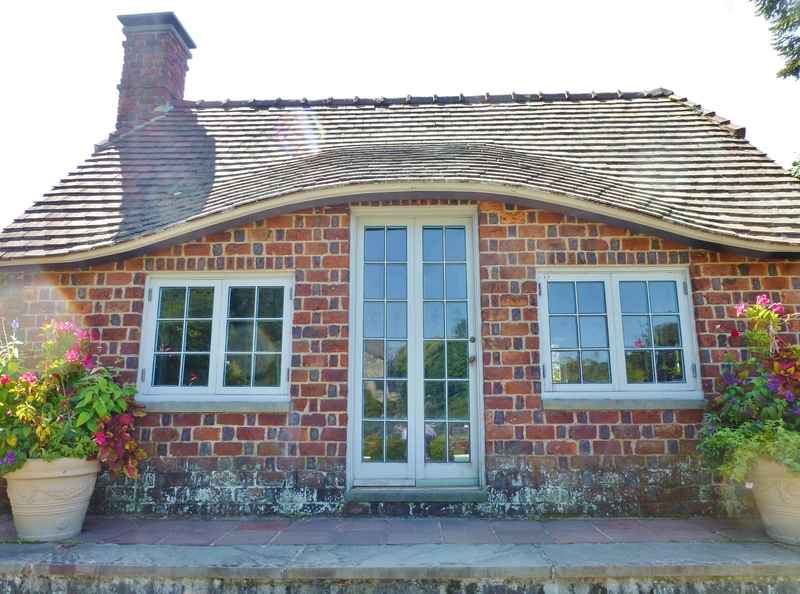 Notice the detail of the brickwork patterns…who wouldn’t love to have such a charming poolhouse? 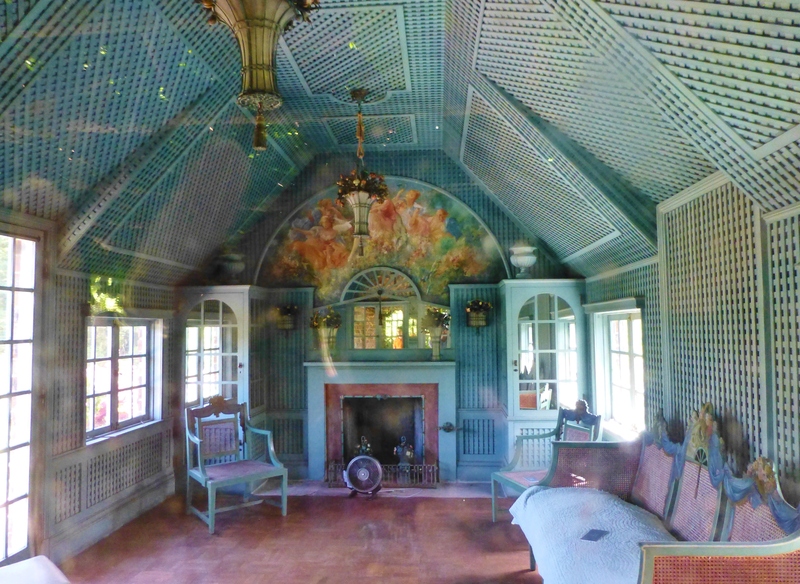 A peek through the poolhouse window shows the amazing lattice-work interior, complete with custom mural above the fireplace. And check out the adorable tole-work chandeliers of flower baskets. Can’t you just imagine having an elegant little tea party in this sweet pool-side getaway? 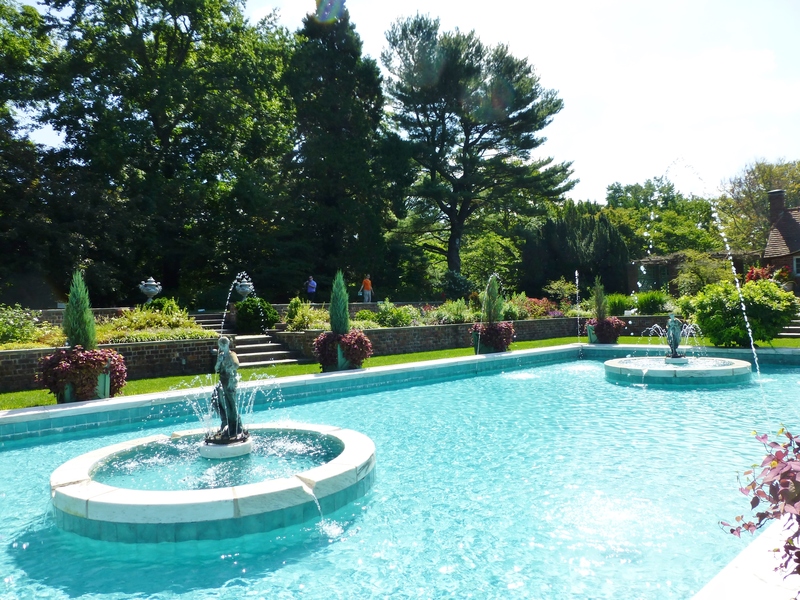 I’ll leave you with this one last look at the sparkling blue water of the Planting Fields Arboretum swimming pool. The statues are keeping cool in the arcing fountains in the midst of all those beautiful flower plantings. How luxurious! Thanks for coming along with me today to Planting Fields Arboretum State Park. I’ll try to share some more of this amazing garden and its equally stunning mansion soon. Until then, feel free to share my posts and images on Pinterest and social media. I love making new friends! 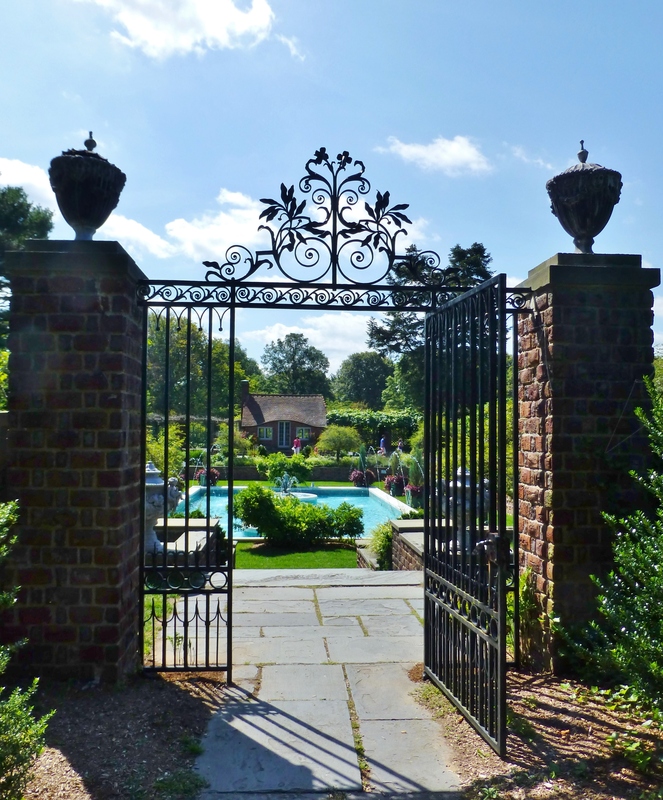 This entry was posted in Architecture, Garden, Historic Sites, Planting Fields Arboretum and tagged Brick Wall, Coe Mansion, English Cottage, Garden Gate, Grecian Statue, Grecian Urn, Iron Gate, New York State Park, Planting Fields, Pool, Pool House. Bookmark the permalink. It’s the coolest pool-house, isn’t it, Sheila? Just perfect in every way! Thanks for commenting.